New ultra-fine fibers created by the MIT team are seen in a Scanning Electron Microscope (SEM) image. Researchers at MIT have developed a process that can produce ultrafine fibers — whose diameter is measured in nanometers, or billionths of a meter — that are exceptionally strong and tough. 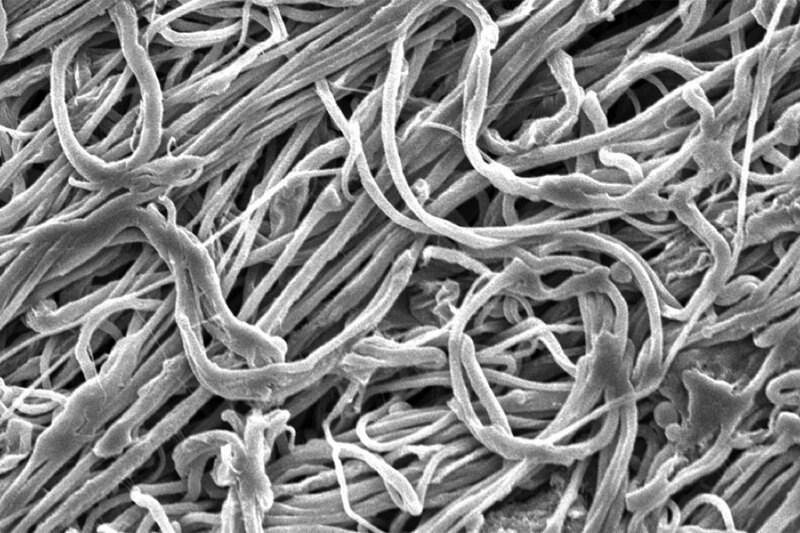 These fibers, which should be inexpensive and easy to produce, could be choice materials for many applications, such as protective armor and nanocomposites. The new process, called gel electrospinning, is described in a paper by MIT professor of chemical engineering Gregory Rutledge and postdoc Jay Park. The paper appears online and will be published in the February edition of the Journal of Materials Science. 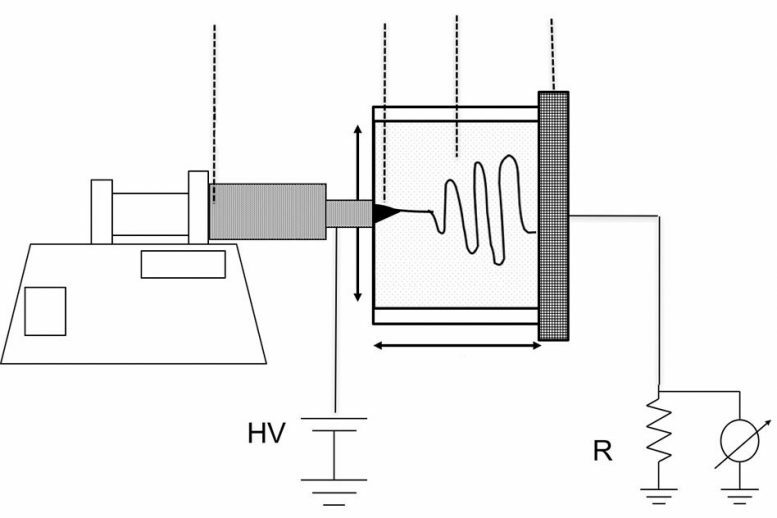 A diagram of the device used to produce the fibers shows a heated syringe (left) through which the solution is extruded, and a chamber (right) where the strands are subjected to an electric field that spins them into the highest performing polyethylene fibers ever made. “We started off with a mission to make fibers in a different size range, namely below 1 micron [millionth of a meter], because those have a variety of interesting features in their own right,” Rutledge says. “And we’ve looked at such ultrafine fibers, sometimes called nanofibers, for many years. But there was nothing in what would be called the high-performance fiber range.” High-performance fibers, which include aramids such as Kevlar, and gel spun polyethylenes like Dyneema and Spectra, are also used in ropes for extreme uses, and as reinforcing fibers in some high-performance composites. “There hasn’t been a whole lot new happening in that field in many years, because they have very top-performing fibers in that mechanical space,” Rutledge says. But this new material, he says, exceeds all the others. “What really sets those apart is what we call specific modulus and specific strength, which means that on a per-weight basis they outperform just about everything.” Modulus refers to how stiff a fiber is, or how much it resists being stretched. Compared to carbon fibers and ceramic fibers, which are widely used in composite materials, the new gel-electrospun polyethylene fibers have similar degrees of strength but are much tougher and have lower density. That means that, pound for pound, they outperform the standard materials by a wide margin, Rutledge says. The researchers are still investigating what accounts for this impressive performance. “It seems to be something that we received as a gift, with the reduction in fiber size, that we were not expecting,” Rutledge says. He explains that “most plastics are tough, but they’re not as stiff and strong as what we’re getting.” And glass fibers are stiff but not very strong, while steel wire is strong but not very stiff. The new gel-electrospun fibers seem to combine the desirable qualities of strength, stiffness, and toughness in ways that have few equals. Using the gel electrospinning process “is essentially very similar to the conventional [gel spinning] process in terms of the materials we’re bringing in, but because we’re using electrical forces” and using a single-stage process rather than the multiple stages of the conventional process, “we are getting much more highly drawn fibers,” with diameters of a few hundred nanometers rather than the typical 15 micrometers, he says. The researchers’ process combines the use of a polymer gel as the starting material, as in gel spun fibers, but uses electrical forces rather than mechanical pulling to draw the fibers out; the charged fibers induce a “whipping” instability process that produces their ultrafine dimensions. And those narrow dimensions, it turns out, led to the unique properties of the fibers. The research was supported by the U.S. Army through the Natick Soldier Research, Development and Engineering Center, and the Institute for Soldier Nanotechnologies, and by the National Science Foundation’s Center for Materials Science and Engineering. Be the first to comment on "MIT Develops Ultrafine High Performance Polyethylene Fibers"